This week's theme: Brought To You By The Letter "G"
Globe, gold, grouper, ginger, grey, gladiolus and grand are the "G" words behind this week's Art of the Day selections. 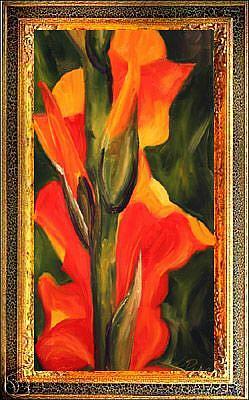 "RED GLADS" is an Original Oil Painting by L Pace, c2005. This painting is an original Oil completed in studio at In Perspective Studio Justin, Texas. “RED GLADS” is a new gallery piece in Backyard Blooms by Laurie “Elle” Pace. This painting is gallery quality art and is being offered on Ebay with out reserve. You will be getting an exquisite Elle Pace Fine Art Original. Please consider the addition of this art in your home to become not only part of your art collection, but a part of your family. 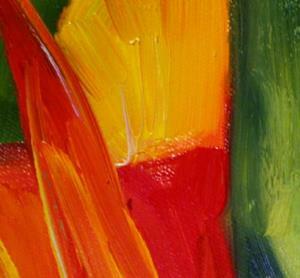 This painting is 12 X 24 inches in size and maybe hung framed or unframed. 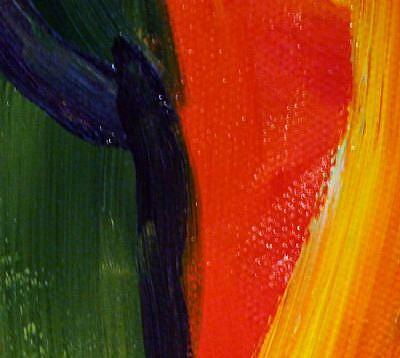 Framing is not necessary because it is on gallery wrapped canvas, and the edges are painted. The painting is not varnished sealed because oils take 8-10 months to cure before sealing. If sealed too early an oil painting can become cloudy in later years. This painting will be shipped within 7 to 10 days in an extra sturdy box and quality packing materials to insure that the painting arrives at your home in perfect condition. All Photos of this painting are for display ideas only and not necessarily to scale. Be sure to check the size description. Gallery Value is $1500 and a COA is provided with purchase. Represented by Earth Works Art Gallery in New York, Laurie’s work will continue to increase in value as buyers from all over the world are building their collections. Now is the time to collect a piece for your home! Laurie Elle Pace Originals are in Private Collections Internationally and can be found at Earth Works Art Gallery in Penn Yan, New York.